Half-Hour Hegel: The Complete Phenomenology of Spirit (eventually): February Online Hegel Q&A and Discussion Tomorrow - Join Us! February Online Hegel Q&A and Discussion Tomorrow - Join Us! 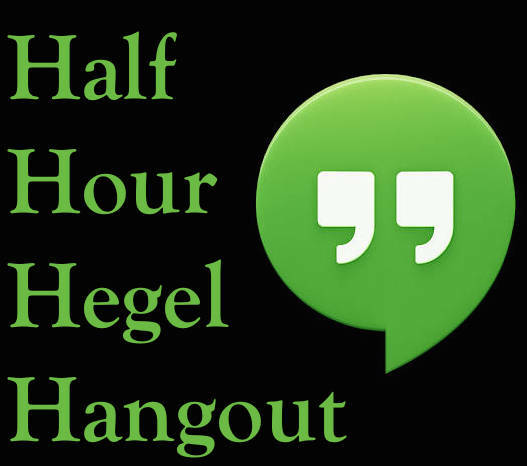 It is time for another monthly online Half Hour Hegel Q&A and Discussion session. We'll be holding it tomorrow evening - from 5-6 PM Central Time. I hope you'll be able to join us for some discussion about Hegel's thought! This session is open to anyone who would like to participate, not just the Patreon supporters of this project. We discuss whatever Hegel-related matters people want to bring up, often straying a good distance from Hegel himself into other topics. I do make sure to give priority to anyone who wants to bring up or ask about something focused on Hegel's thought. If you'd like to participate, we use FreeConferenceCall as our videoconferencing platform - here's the link that you'll need to use to get into the session. Support by my Patreon supporters makes work possible for me to engage in and continue, so if you're interested in chipping in a bit to underwrite this crowdfunded project, here's my page.